Jurassic Apartments Holiday Home has a kitchen/lounge/diner with open plan seating. There are 3 en suite bedrooms, one double with king size bed is on the ground floor. A twin with en suite shower room and a double with en suite shower and bathroom with king size bed are on the first floor, both with sea views. There is a small private garden but all of our self-catering guests are welcome to use the farmhouse gardens, the summer house and the footpath leading down to the South West Coastal Path. The beach at the Fleet Saltwater Estuary is just 300 metres from the farm. Large parties can be accommodated in all 3 of our self catering units and our B&B, but rarely last minute as we always have advance bookings for some of the accommodation. Early booking vital in peak periods. Our farmhouse is ideally situated in 35 acres of and of special scientific interest on the Jurassic Coast. We're just 2 miles from the National Sailing Academy and Portland Marina where there is a multitude of water sports available. We have 5 B&B rooms and two self catering apartments (min 3/4 nt stay) on the farm. There is a self-catering Holiday Home with a small private garden for dogs and 3 en suite bedrooms, including one ground floor bedroom. Our self-catering Bungalow has two double bedrooms and disabled access. We also have The Swallows Suite, a huge B&B room with super king bed, 2 single beds, luxury shower room, table, chairs, sofa and stunning views of Portland and Chesil Beach. Breakfast in bed is included in the daily rate for this room. We're just 2 miles from the 2012 Olympic site, Portland and Weymouth. With gardens and fields leading down to sea it's a stunning location. For more B&B rooms please contact us for for availability. Ref E3200. Our guests are encouraged to treat Swallows Rest as a home from home. We have a large guest lounge with 3D TV, a summer house for the warmer months, a hot tub heated to 37 degrees, and gardens and fields leading down to the Jurassic Coast which is just 300 metres from the farm. In the gardens we have pet pigs George and Mildred wandering along with beautiful bantams, chickens, geese and ducks and a lake. Sometimes our Alpacas Kim, Barney and Angus are in the gardens and sometimes in the fields where we have a small campsite. We have liveries and up to 20 horses on the farm, but no horse riding facility. There is also a small campsite, open 365 days a year on the farm with amazing views of Chesil Beach and the Fleet Lagoon. Enclosed garden with access to large farmhouse gardens. In farmhouse garden shared with B&B guests, allocated times. Year round. We were made to feel very welcome on arrival and found the property to be very relaxing and comfortable. There were 5 of us staying for 4 nights and we found the property gave us more than enough space particularly with the 3 large en-suite bedrooms. There is a small private garden but we also enjoyed sitting in the main grounds with the chickens, ducks and pigs wandering around. A very enjoyable stay thank you. The house was very spacious and to have 3 en suite bedrooms is quite unusual. Very quite and lovely garden to share. Garden contained many types of bird and was great for the children. Would recommend to others. 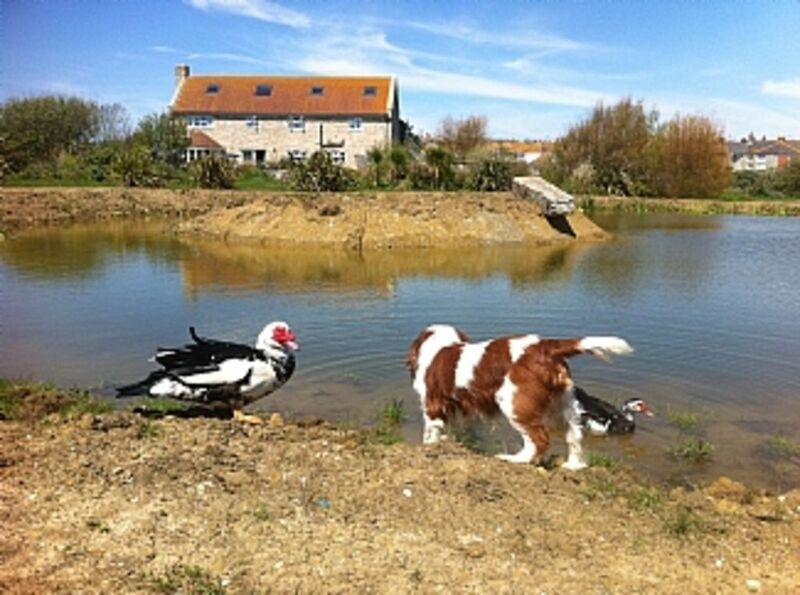 The house is on a farm close to Chesil Beach with easy access to pleasant walks along the Fleet lagoon. We appreciated the well equipped and comfortable accommodation, especially the 3 en suite double bedrooms. The living room and kitchen were spacious and the small garden was an additional bonus. Our hosts were very friendly and helpful. Owner was very pleasant.Cottage was great.Was spacious, clean and very well equipped. My girls loved having their own ensuite bathrooms, they also had lovely views of the sea. Also had their own tv's, felt very spoilt. Available for bridge holidays. 4/5 tables of bridge can be made up with local bridge players. Art lessons are available during your stay. Swallows Rest is on the world famous Jurassic Coast and the South West Coastal Path is 2 minutes' walk from Farmhouse. We are on Chesil Beach and the Fleet Lagoon with a small rural beach on our land. Weymouth main beach is less than an hour's walk from the farm or a 5 minute drive. Hurn Airport at Bournemouth is 43 miles from the farm. Weymouth British Rail and Bus stations are 3 miles away. Weymouth and Portland are less than 2 miles from us and Dorchester is a 10 mile drive. There are a huge number of very interesting Dorset villages to visit in the area, far too many to mention! Coastal drives are spectacular, especially the road from West Bay and Bridport to Swallows Rest. We are located in the Fleet Nature Reserve and our beach is just a 2 minute walk along a footpath down to the sea. The Crab House Café, The Khazana Indian Restaurant and the Wyke Smugglers Pub are all in the village and easily accessible by foot. All serve excellent food and are between a 5 and 10 minute walk from the farm. We have a nearby Co Op, Cake Shop, Village Store, Fish & Chip Takeaway, Chinese Takeway and Post Office. Weymouth town centre and the main sandy beach are less than 3 miles away and here you will also find a variety of dining possibilities from fine harbour side restaurants to traditional fish and chips. Booking Notes: We take payment on arrival for our B&B guests. For self catering accommodation we take £100 deposit and the balance is due 6 weeks prior to the date of arrival. Changeover Day: Check in time is after 2pm. Checkout for self catering is 10am and for B&B checkout is 11am. We appreciate an estimated time of arrival. Notes on prices: Our self catering accommodation costs from £95 a night, min 3 night stay. B&B prices range from £75-£105 a night for 2 guests including huge breakfast with locally sourced dry cured bacon and our own free range chicken and duck eggs, home made granola, marmalade, jams & lemon curd. For caravan pitches with electric hook up our prices range from £18-£23 and for tent pitches the cost is from £12-£15 a night for 1-2 campers.